The onus of defeating right-wing extremists already falls on Muslim voters. Now liberals expect them to abandon a winning candidate in favour of a social-media celebrity, Kanhaiya Kumar. 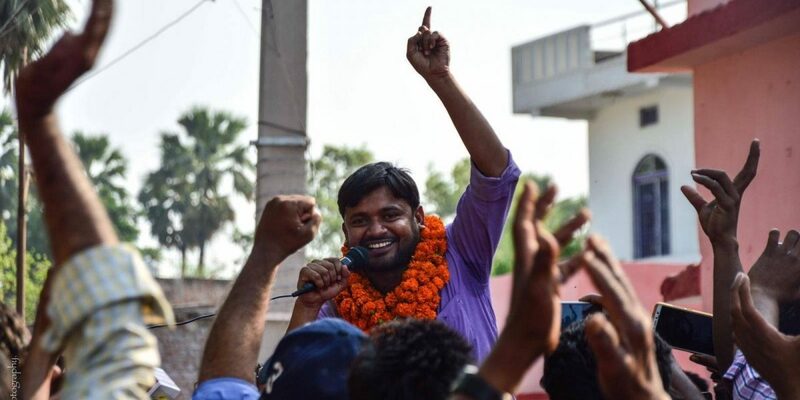 CPI’s upper caste (Bhumihar) Hindu candidate Kanhaiya Kumar. The BJP has received significant vote share from almost all Hindu castes, so the responsibility to defeat the ruling party has been transferred onto Muslim voters. In Begusarai, both the CPI and the RJD are pursuing Muslim votes. Without the CPI, it would have been a straightforward fight. Muslims would vote for the RJD and Giriraj Singh would likely be defeated. During the last election, Tanveer Hasan secured 3.5 lakh votes, and lost by a margin of around one lakh votes. The CPI+JDU diverted around two lakh votes. This year, presumably, Muslims, along with other communities allied with the RJD, would attempt once again to get Tanvir Hasan elected. But as in 2014, the CPI is playing spoilsport again, while crying for unity against fascism. The magical presence of Kanhaiya has left even many Muslims confused. Mohammad Sajjad, a faculty member at Aligarh Muslim University, wrote an article arguing for Kanhaiya as a viable or even preferred candidate. He chastised Muslims campaigning for Tanveer for their ‘communal’ mindset, and reduced the Muslim demand for representation to ‘identity politics’, asking Muslims to imagine a circumstance where Hindus would vote only for Hindus (as if that needed any imagination). He also raised the issue of caste fault-lines among Muslims, and how the RJD is fielding upper-caste Muslims candidates, and no one is talking about backward Muslims. 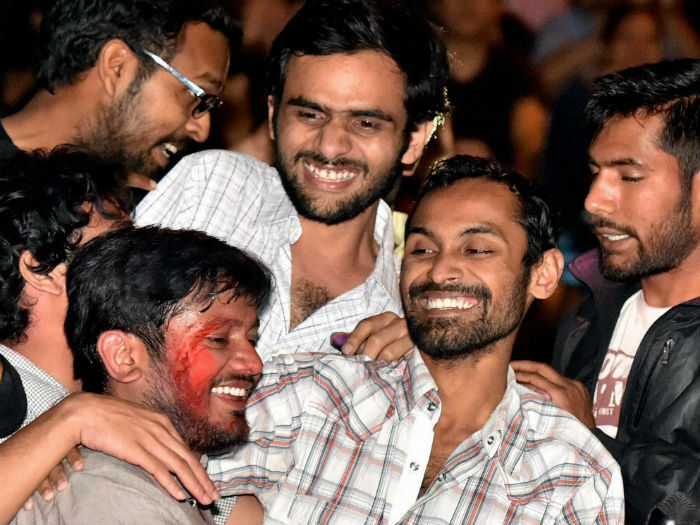 Kanhaiya, in his opinion, is a ray of hope and change: Muslims should come out of their shells and vote for him. Another article campaigning for Kanhaiya, written by Umar Khalid, presented a less-informed version of the same view. It argued that in the face of ‘fascism’, we should rise above our ‘identities’ and vote for Kanhaiya. There is a lot to unpack and disentangle in this matter, but I will start with the accidental hero Kanhaiya Kumar, who rose to eminence after being found at the wrong place at the wrong time, talking about the wrong issue. 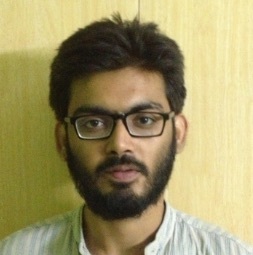 He was elected president of the JNU students’ union in 2015 as a candidate of the AISF after a rousing presidential speech. In February 2016, a protest over the hanging of Afzal Guru and atrocities in Kashmir took place on the campus, which led to a crackdown by the BJP government. Many students were charged, including a number of Kashmiris. Kanhaiya’s arrest was ironic, as he and his party hardly had a similar stand on the Kashmir issue. After being assaulted by a mob of lawyers in the Patiala court, Kanhaiya became an instant hero for many. On his return to campus, he turned the Kashmiri slogan ‘India se Azadi’ around to make it ‘India me Azadi’. It is worth noting that the sedition case was a reality for those who dared raise such slogans, but it is Kanhaiya who received the bulk of the coverage. Saquib Salim has discussed the role played by the liberal media in this leader-making process. He contrasts it with the cases of some backward students of Lucknow University, who suffered for showing a black flag to the PM. They were jailed and beaten up, but no one knows their names. The BJP chose the narrative, and the liberal media valorised the ‘villains’ constructed by the Sanghi media. Kanhaiya’s greatness lies in being arrested accidentally, and then being assaulted by lawyers. Some argue that he is a decent speaker, but that is true for hundreds of student leaders in Begusarai alone. It does not make him eligible to become an MP. If he is really a national figure, then he should contest from a symbolic seat, like Kejriwal did, rather than ensure the defeat of a Muslim candidate in Begusarai. As far as the CPI is concerned, it received Muslim votes for decades in West Bengal (along with the CPI(M)), and kept the Muslims there in a state of deprivation. This has been noted in the Sacchar Committee report, which names West Bengal as having some of the worst development indicators for Muslims in India. The Left Front also kept almost all Muslims in the general category, even though most are from backward classes. It was Mamata Banerjee who included the majority of Muslim castes in the OBC list, within the last decade. Another feature of the CPI has been its reliance on upper-caste leaders as articulate speakers on Marxism. Kanhaiya is just the latest in a long list of upper-caste Hindus who have risen as CPI leaders. Interestingly, the BJP expects the bulk of its votes from the same caste as Kanhaiya Kumar. This says a lot about the ‘revolutionary’ nature of the upcoming contest. Tanveer Hasan, meanwhile, is an MLC and a veteran leader who has been involved in socialist movements since the 1970s. He is the most suitable choice for backward castes and Muslims seeking to defeat the BJP. The choice should have been clear. On one hand you have Kanhaiya, a social media phenomenon, from a community that supports the BJP, representing a party whose record on Muslims is questionable. On the other hand, you have Tanvir, a Muslim candidate, from a party famous for making Bihar free of communal violence – as well as for seeking affirmative action for backward Muslims. Yet his supporters have left no stone unturned in swaying Muslim votes to Kanhaiya, and defending the CPI’s ill-advised step of fielding a candidate against Tanvir Hasan. Their first argument goes like this: ‘Imagine if Hindus vote only for Hindus. What will happen to the Muslims?’ We do not need to imagine this scenario: it is the reality of Indian politics. In 1952, even Maulana Azad had to contest from Rampur as it was the only Muslim majority seat of UP. Mohammad Sajjad himself writes about another such example: in the 1962 elections, when Maghfoor Aijazi contested from Muzaffarpur as an independent against Congress. Indira Gandhi had to make special campaigns for the Congress in Muzaffarpur, with speeches to polarise the votes along communal lines; consequently, Aijazi lost it even though he did secure as many as 58,000 votes. What changed in the past three decades in Bihar was that caste fault-lines helped create an alliance between Muslim and backward communities, allowing Muslim candidates to gain Hindu votes against Hindu candidates. But invoking the picture of Hindus voting only for Hindus is of no use in the Bihar of 2019. The second charge is of Muslim communalism, and it is the one most repeated. Scholars and researchers have been conditioned by the Congress’s use of this word to the extent that even Muslims are embarrassed to ask for representation. Next, the Leftist phrase ‘identity politics’ is added in, ignoring the fact that Muslims are a besieged minority, and like Dalits, it is their right to use their identity to mobilise. When Dalits rally around their caste identity, our liberals become ‘casteless’; similarly, when Muslims seek redistribution, liberals become ‘secular’ and accuse us of ‘identity politics’. Finally, the issue of lower caste Muslims in Bihar politics. There is no doubt that upper-caste Muslims have had the greater share of representation. But that has changed slowly over the past three decades, as Lalu, and to a greater extent, Nitish Kumar, sought lower caste Muslim representation. This year, the RJD is fielding 19 candidates, of which four are Muslims. Two of them belong to the Sheikh community, one to Sayyid, and one is Pasmanda (from the Kulhayya community). According to the 1931 caste census, around one-third of Muslims in Bihar called themselves ‘Sheikh’; making this the largest block among Muslims. 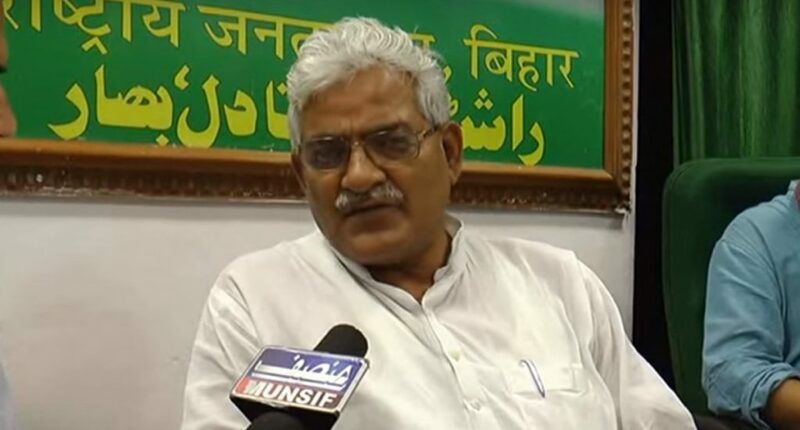 It is true that another backward Muslim candidate should have been fielded, but the RJD cannot be criticised to defend the CPI. It is comical to ask Muslims to vote for a Bhumihar against a Muslim candidate, just because the latter is a Syed. Yet this is the extent to which liberal Muslims can go to avoid being called communal. Sharjeel Imam is a graduate from IIT Bombay. He is currently a PhD scholar in modern history at JNU, studying Muslim politics in late colonial India.